The Celts perceived the presence of divine forces in all aspects of nature. Patterns of harmony and balance, dark and light, winter and summer, female and male are woven throughout Celtic tradition. Celtic knots and patterning reflect their belief in the continuity of life and the interconnection of all things, plants, animals and otherworldly divinities. 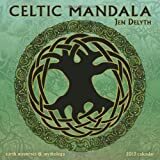 The Celtic Mandala wall calendar presents the magical weavings of Welsh artist Jen Delyth in calendar form. Jen's work is founded in her deep connection to her Celtic heritage. She creates intricate paintings and illustrations, using traditional egg tempera and contemporary digital techniques. Her original iconographic style is inspired by the Spirit in Nature and expresses our mythic connection to the natural world.